In my previous posts we discussed the per-requisites and the installation of ATA in this post we will discuss the configuration. Logon to your console http://ata.yourdomain.com/configuration navigate to ATA Gateways. You should then see the gateway recently installed. You will then have a section for port mirrored domain controllers of which you will need to add one at a time all the DC’s that make up the organization. Then select the 2nd NIC which should be your port mirrored NIC to capture the traffic. Once the initial sync has run which depending on the network can be quite quick you can then go and configure some further settings under the detection tab. Honeytokens are honeypots that are not computer systems. Their value lies not in their use, but in their abuse. As such, they are a generalization of such ideas as the honeypot and the canary values often used in stack protection schemes. Honeytokens can exist in almost any form, from a dead, fake account to a database entry that would only be selected by malicious queries, making the concept ideally suited to ensuring data integrity—any use of them is inherently suspicious if not necessarily malicious. In general, they don’t necessarily prevent any tampering with the data, but instead give the administrator a further measure of confidence in the data integrity. The last two areas DNS Reconnaissance and Pass-The-Ticket exclusions are for IP’s that you want to exclude from ATA monitoring which may flag up any issues. Click save and wait for the settings to replicate. Next if you want ATA to send out mail alerts go to the Alerts tab and config the settings as required. ATA also fully works with Office 365 as long as you have a licensed account. Finally you may want to ensure the product is licensed pop down to licensing and enter your product key. Then wait for 30 days for ATA to get a good over view of your environment and look out for alerts! Now just to be clear this doesn’t mean ATA will wait 30 days before it finds anything suspicious it will alert instantly if anything is discovered. In my previous blog post I discussed the requirements for ATA in this post I will discuss how to install ATA. Internal certificate from a CA – Now this can be changed later to a public certificate or a certificate with multiple SANS. But by default the wizard will only create the certificate with a single name which is the servers hostname by default. Click install and the installation should complete. Then click Launch to launch the console you will notice certificate errors as by default ATA uses the console IP address to create the shortcut on the desktop. At this stage if you want to change the certificate this is the best time to do so. Create your certificate with the additional names required (it must contain the server name as one of them) the SAN could be something like ATA.yourdomain.com (also ensure you create an internal DNS A record that will resolve to the correct IP address). Insert the certificate into the store locally on the server, then in bindings on IIS to change the certificate to your new one. Note that if the certificate does NOT have its private key IIS will throw up and error so ensure this is imported at the same time. Restart IIS fire up the console with your name e.g. ata.yourdomain.com/configuration and you should be able to log in with your admin account without any warnings. 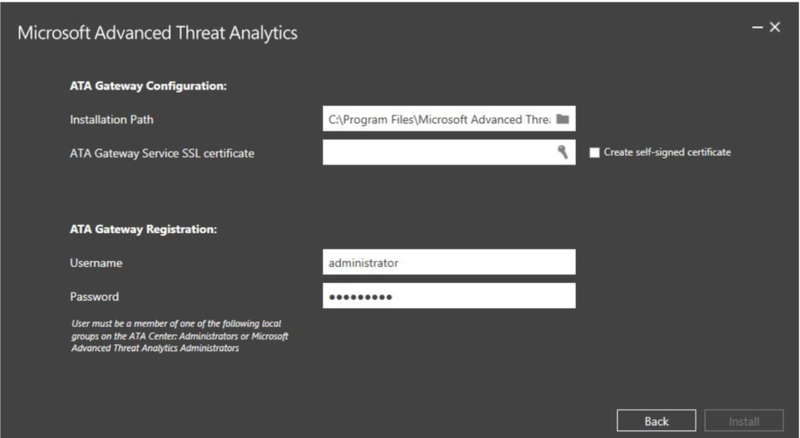 If you wish at this stage to create extra admins these can either be members of the local administrators group or the Microsoft Advanced Threat Analytics Administrators Group. Now because these are local groups you might want to create an AD group and nest this within the ATA Admins group to make it easier to manage. This completes the installation. In the next part we will discuss the configuration of ATA in part 3. 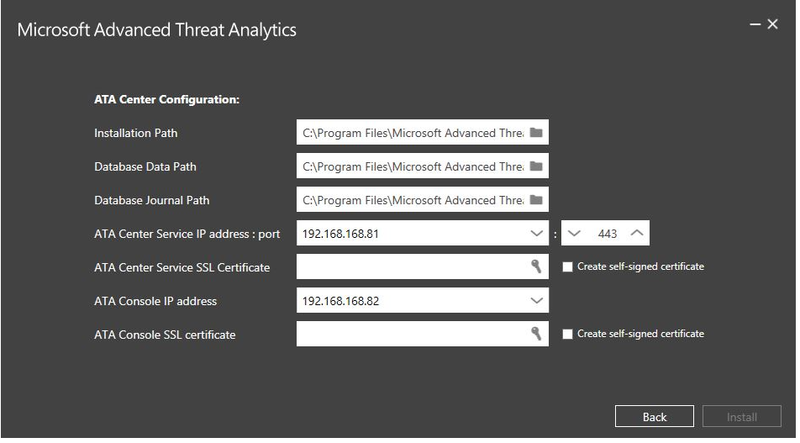 As some of you may be aware Microsoft Advanced Threat Analytic’s has just been released so I took the time to go through the RTM version and below is a step by step guide to getting the platform in place. It should be noted at this time it is only supported to install this on premise and NOT within Azure. This is simply because it currently has not been tested by Microsoft. The servers can be either domain or work group joined depending on the environment. Virtual Virtual on same host The virtual switch needs to support port mirroring. Moving one of the virtual machines to another host by itself may break the port mirroring. Virtual Virtual on different hosts Make sure your virtual switch supports this scenario. Virtual Physical Requires a dedicated network adapter otherwise ATA will see all of the traffic coming in and out of the host, even the traffic it sends to the ATA Center. If the virtual host is on the same physical switch, you will need to configure a switch level span. If the virtual host is on a different switch, you will need to configure RSPAN or ERSPAN*. Physical Physical on the same switch Physical switch must support SPAN/Port Mirroring. Physical Physical on a different switch Requires physical switches to support RSPAN or ERSPAN*. *ERSPAN is only supported when decapsulation is performed before the traffic is analyzed by ATA. I will come back to the importance of port mirroring shortly. For the ATA Center Sizing below is the guidance provided by Microsoft. Note the ATA Center includes both the Center and the Console roles of which cannot be split and this is local storage as the Database cannot be on another server. This server should also have a single NIC with two IP addresses, it is possible to configure the service with one IP address although this is not recommended. The ATA Gateway has the following hardware. For this server it should be noted that two NIC’s are required and the second NIC should be attached to the same switch as the domain controllers that it is monitoring, following the guidance regarding port mirroring above. **This includes physical cores, not hyper-threaded cores. Once you have all of this you will also need to create a service account as a standard user as this will be used by the ATA center to gather information on AD users. The final note is that both ATA servers cannot be out of time sync by more than 5 minutes of each other. In part 2 I will go through the installation in more detail.